Misty Fiords National Monument, covering just over 2 million acres within Tongass National Forest in the panhandle of Southeast Alaska, was granted national monument status in Dec. 1978. Glaciers carved deep gouges in the granite mountains creating deep fjords where steep rock walls rise 2,000–3,000 feet above sea level, and the water depth is over 1,000 feet straight down from the rock faces in many places. 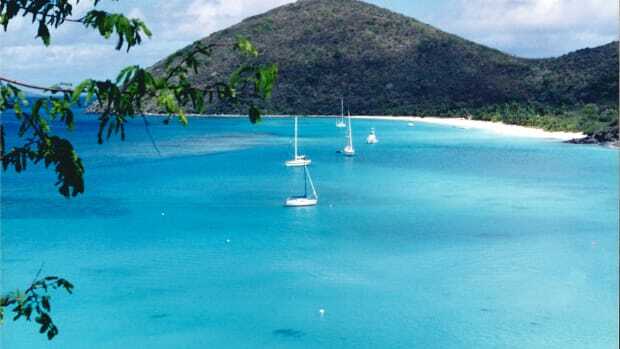 There are numerous bays, coves, and inlets that provide safe anchorage, most offering stupendous views to boot. Marine life and other wildlife abounds in the area, and it is common to see whales, porpoises, sea lions, deer, bears, otters, mink, eagles, and sea birds of all types. I have been cruising Southeast Alaska for 30-plus years in various vessels and have made numerous trips back into this area. My wife Lisa had only recently moved to the area from Las Vegas, and I was eager to show her what Misty Fiords had to offer. We planned a six day, five night, close-to-home cruise to the Misty Fiords National Monument during late May and early June. The weather and associated sea conditions in this area can be dangerous, but at this time of year you can expect the highest probability of extended periods of good weather. The cruising ground is most easily accessed from our hometown of Ketchikan, Alaska, (population approximately 14,000), but can also be reached from other Southeast Alaska communities. It is a popular destination for many of the cruise ship passengers that visit Ketchikan. There are numerous flight-seeing tours and day trips by boat in the summer, however, the savvy cruiser can easily avoid the tourists and enjoy the wilderness splendor offered in the area. For anyone who is considering cruising in the Misty Fiords area, I strongly recommend Exploring Southeast Alaska (Dixon Entrance to Skagway), by Don Douglass and Reanne Hemingway-Douglass. This guidebook tells you about every nook and cranny in the area and is an invaluable asset. Our vessel for this voyage was the M/V Faraway, a 2008 Mainship 34 trawler. I took possession of her in Vancouver, B.C., and ran her approximately 700 miles up to Ketchikan as her maiden voyage. 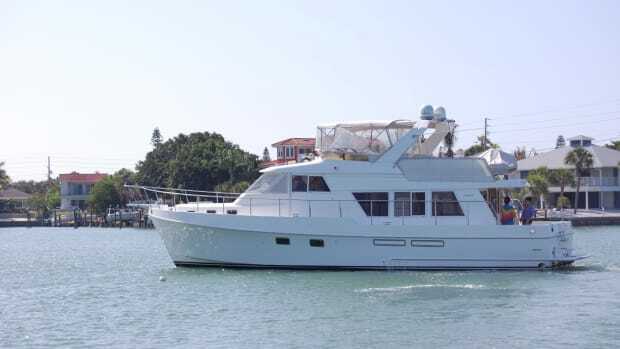 She is a good vessel for a couple that plans to spend anywhere from a day to several weeks aboard in relative comfort. The weather in Southeast Alaska in late May and June allows you to run almost all night (without radar), if you want to, in good weather. The long daylight hours allow plenty of time to put in the miles, stop for pictures, yet still find a good place to anchor for the night and enjoy a pleasant evening aboard. We pulled out about 2:45 p.m. in sunny weather with light northwest winds—perfect for running from the flybridge. Because of the extra-wide beam of this boat and the flybridge extension, the flybridge area is very roomy, a wonderful place to be in good weather. As we approached Mountain Point, barely a few miles from town, we saw a pod of killer whales. We got a few pictures as they streamed past us. This was a derby weekend in Ketchikan. Each year beginning on Memorial Day weekend, the local King Salmon Derby is held, with significant prizes to be had. Many boats were out fishing that day, and since the weather was so nice, many of them planned to stay the night out. As a result, our first two potential overnight spots were too crowded for us, so we moved on in search of more solitude. Our first night was spent in Alava Bay, on the west shore of Revillagigedo Island, in Behm Canal. It’s only 26 miles from our homeport, but with our two stops in other locations, our relatively late start, and our stop to watch the whales, we were running out of daylight. Alava Bay has a U.S. Forest Service cabin and a mooring buoy, and I was hoping to get the buoy. Alas, the mooring buoy was taken, and we were out of daylight, so I anchored nearby for the night. In the morning of day two, the weather was calm and beautiful. After breakfast I was preparing to get under way when the vessel that was on the mooring buoy left. We made the snap decision to stay another night in this location. As soon as the mooring buoy was free we moved over and tied on. Mooring buoy etiquette in this area is important. Several years ago one man was killed and another seriously injured when they tied onto another vessel that was already tied to the mooring buoy. 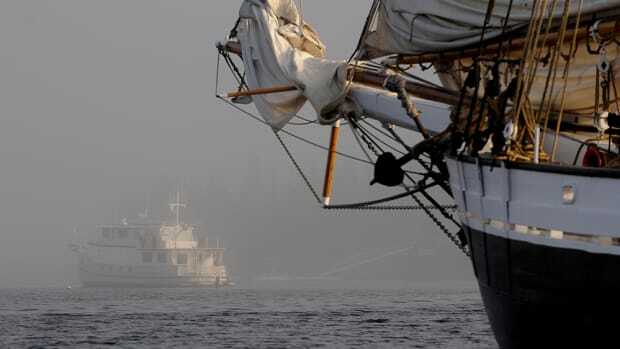 The owners of the first vessel opened fire from shore on the other boat, with deadly results. Shortly after dinner the weather started to kick up. The mooring buoy is not fully protected so we started to roll. Fortunately it was close to bedtime, so my wife, who has not yet earned her sea legs, took a Dramamine and slept like a baby. On day three the swells had subsided and the skies were overcast with only light winds. We made a short excursion into Smeaton Bay, but in the interest of time and fuel we did not go all the way back. We made the obligatory circle around New Eddystone Rock, a pillar of basalt approximately 230 feet high that rose from a volcanic vent in the floor of Behm Canal sometime in the last 5 million years. The rock is named after a lighthouse in the south of England that was originally built of wood, but kept getting destroyed by high seas. Eventually the lighthouse was rebuilt out of rock, hence the resemblance to the basalt column. It is indeed an impressive sight. Our home for this night would be the small cove in front of the Forest Service cabin at Winstanley Island. There is a mooring buoy there, however, if it is taken, there is ample swinging room for several large boats to anchor in the protected area. Access to the cabin and mooring buoy is via Shoalwater Pass. You must pay close attention to the tides and the draft of your vessel to get through there at low water; it can be impassable for larger vessels. We were fortunate enough to get the buoy for the night. There were people in the cabin, but it appeared they had been dropped off by plane or boat, as they only had small inflatable kayaks on the beach. The mooring buoys in most locations are first-come, first-served, and do not necessarily go with the cabins. 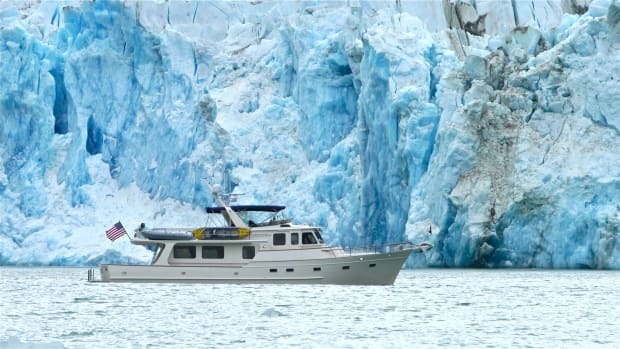 This anchorage is bulletproof in any weather and makes for a comfortable place to spend an evening or even a few days. I put the raft in and baited our two crab pots. A couple of Dungeness crabs would make a great addition to our meals. I motored quite a distance from the mooring buoy to set the pots, but they came up empty the next day when I pulled them. The people from the cabin paddled out in their kayaks and pulled their pots, which were within spitting distance of our boat; they got a respectable haul. We went to shore and had a nice beach walk. Manners in this part of the world dictate that you greet the people in the cabin, but try not to intrude on their outdoor experience any more than necessary. The following day was still calm and beautiful with just a touch of light rain. 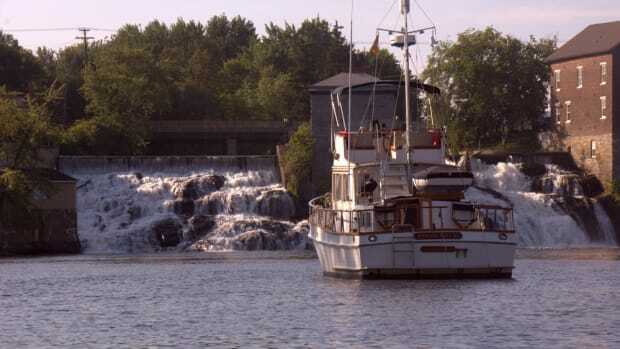 We motored out through Shoalwater Pass and into the main part of western Behm Canal. There can be good halibut fishing in this area, so we tried a few places, but were unsuccessful. Fortunately, our freezer held the results of previous fishing trips, and each evening we dined on salmon, halibut, shrimp, and other goodies from the sea. We entered Rudyerd Bay, which, after New Eddystone Rock, is one of the primo areas in this region. 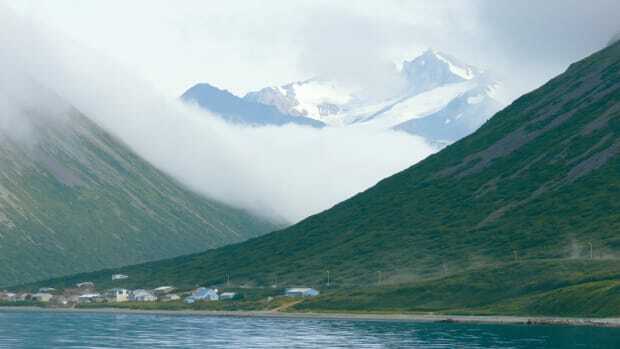 Within its steep walls are several large coves, such as Punchbowl Cove, where the effects of the glaciers are easily seen and stunningly beautiful. There are numerous steep granite cliffs and dozens of threadlike waterfalls streaking down thousands of feet into the fjords. It is a photographer’s heaven. After taking our time exploring Rudyerd Bay, we motored out and headed across Behm Canal for Manzanita Bay. The weather was gorgeous, the water was flat calm, the boat was performing well, the food was good, the company extraordinary, and we were heading to yet another beautiful anchorage for the night. It doesn’t get any better. One of the things I enjoy most about cruising is what I call “cabin time.” The main cabin on Faraway is small by most passagemaker standards, yet it is perfect for two people, and has all the comforts of home. We spent the evening looking at our photos. We have a TV and DVD player, but in the summer with so many daylight hours and so many other interesting things to do, they rarely get used. In the winter, when cabin time increases due to short daylight hours, they get more use. Day five was special. With a -4.3 tide in the morning, we woke early for our low-tide beach walk. We shot some good pictures of a deer that was also out for a walk, and a black bear that was foraging in the grass. I was concerned about our freshwater supply, so I had taken some water jugs to shore, which I filled up from a fast-moving creek. We pulled anchor and moved on up the canal and into Walker Cove. Walker Cove goes deep into the fjords, and is high walled and rocky all the way in. Once you get back to the head of the bay it changes to a large, green grassy area, where there is a mooring buoy. We lingered in the area for some time, hoping to see some bears. No luck today, so we headed back out of the bay. We had logged about 100 miles to this point, and my original plan had been to completely encircle Revillagigedo Island, by way of Behm Canal. It is about 128 miles around the island by the most direct route. Though we had plenty of fuel to complete the circle, we made the decision to go back the way we had come. Once you leave Walker Cove there is a fairly long stretch of relative nothingness as you move up to the northernmost point on the island. I was heading for a small local anchorage known as Ice House Cove, so named because in years past there used to be an ice house in there. It is a great little spot, protected in any weather. 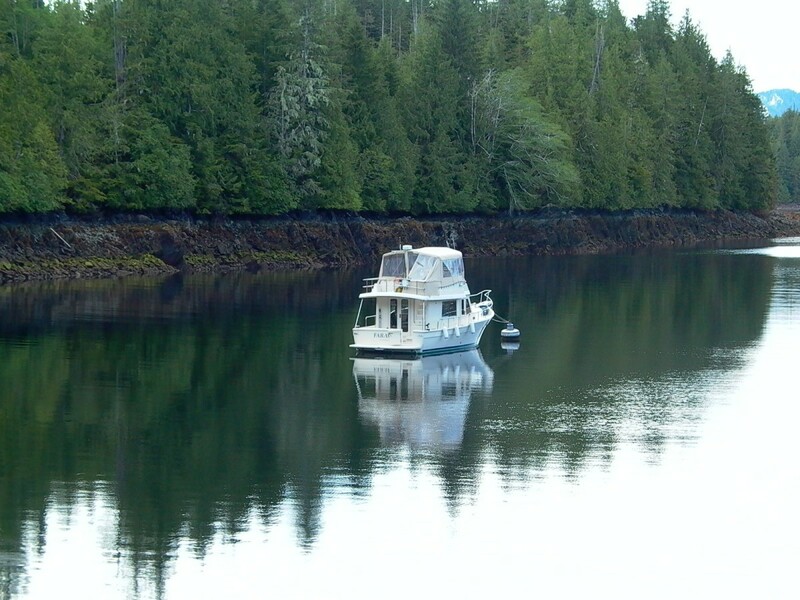 However, since it is such a good anchorage and close to Ketchikan, it is used heavily by local fishing boats. Although small, there is a Forest Service mooring and I had high hopes to get the buoy. But as we approached I could see the mast and trolling poles of a fishing boat on the buoy. I stopped and drifted as I mulled over what to do. I really did not want to head for home, but I was tired from a long day at the helm. As if on cue, the troller pulled away from the mooring buoy and left the cove. We moved in, grateful for a secure place to enjoy our last night out. It was a quiet night on the mooring buoy, and Lisa was happy to see there was indeed phosphorescence in the water here. A few fishing boats moved in and anchored just after dark. They were early birds though, and by the time we arose in the morning, they were gone and we hadn’t even heard them leave. Now raining, we dressed in rain gear to go hiking, but the woods in this area are almost always wet anyway. We took the raft to shore and started up the Forest Service trail. We had a good, albeit short, hike through the rain forest and after yet another good lunch aboard, we headed for home. I stopped by the fuel dock on the way in and took on about 80 gallons of diesel. Total mileage for the trip was a little over 160nm. Misty Fiords is a “must see” for any cruising vessel passing through the Ketchikan area via the Inside Passage. You can take a week (or more) to do it, or do it in just a few days, but you really must do it. Bring your camera, your rain gear, and enjoy.